Vacationing—or, more specifically, flying on an airplane—affords me opportunities unknown in the remainder of my day-to-day life. From the irrational anxiety I feel if I’m not at the airport at least an hour before my flight, to submitting to a full-body x-ray for some reason, to paying $8 for a blueberry muffin, to being berated by a slightly-higher-than-minimum-wage employee because I didn’t take my shoes off fast enough—air travel offers experiences I just can’t get anywhere else. And thank God for that. One more pleasant example is my perusal of the free SkyMall catalog, a periodical packed with insane products that I wouldn’t contemplate for a moment if I were within 20,000 feet of sea level. Yet, somehow, at altitude, I mull them over. 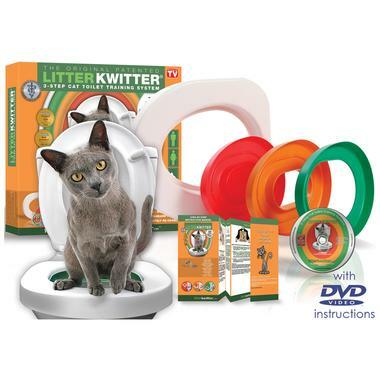 There are dozens of bad ideas for gifts (or good ideas for bad gifts, depending on your perspective), from Justin Bieber singing toothbrushes to “Litter Kwitter,” a potty-training system for your cat. Yet, of all the zany items listed this year, there was one that exceeded the implausibility of all the others. No, it wasn’t a life-sized Bigfoot statue, or an irrational numbers wall clock, or even a “disinfection scanner” to kill hotel bed bacteria. No, the item in question was a seemingly innocuous autographed basketball in a glass display case. We have a couple of problems, here. In case you missed it, a Jason Kidd basketball will set you back $99.99. Which, coincidentally, is the exact same price as an empty display case. In other words, air apparently has the same value as a basketball signed by Jason Kidd. We know that a ball has some intrinsic worth. Therefore, I can only conclude that Jason Kidd’s signature somehow devalues the item in an amount equal to its objective price. This has to be devastating news for Jason. It would be like Nicolas Cage Liam Neeson discovering that his latest movie release costs the same as a blank DVD. 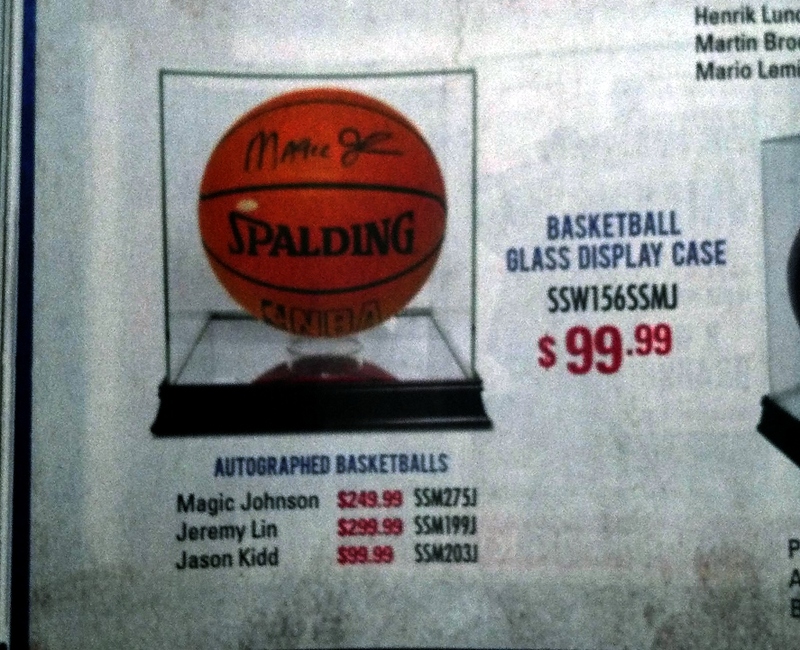 But there’s an even bigger problem with this page from the catalog: An autographed Magic Johnson basketball costs $249.99, but an autographed Jeremy Lin basketball sells for $299.99. To repeat that: A Jeremy Lin basketball costs more than a Magic Johnson basketball. And three times as much as a Jason Kidd basketball. Let’s forget about Kidd for a second and just focus on Magic and Lin. Here’s a snapshot of Johnson’s career . . .
And, now, here’s a look at Lin’s resume . . .
Jeremy Lin: Three teams in three years. Scored 1,105 points so far in his career. 10.3 PPG career scoring average. Currently third in the NBA in steals per game this season. One-time NBA Player of the Week. Now . . . I understand that Lin was a hot commodity last year. And he’s been fairly good in his new environs in Houston. I also understand the concept of supply and demand. But it’s not like Magic is out of the public eye. He’s part of ESPN’s studio analyst team. Even if the case could be made that Magic’s legacy is nonetheless trumped by Lin’s currency, surely the fact that Magic is also an ESPN personality mitigates against that. On the other hand, volumes have been written on the subject of the increasingly-fleeting attention spans of modern American youth. I suppose that it’s possible that they honestly put so much value on Jeremy Lin being within their memory that his basketball (and his career) means more to them than Magic Johnson’s does. Just keep in mind, however, that this is the same generation that would shell out $15.00 for a Justin Bieber singing toothbrush. This entry was posted in Commentary, General Culture and News, Sports and tagged Commentary, General Culture and News, Jeremy Lin, Justin Bieber, Litter Kwitter, Magic Johnson, Memorabilia, SkyMall, Sports. Bookmark the permalink. I’d love to know how there can be a recession and still a market for stuff like that!